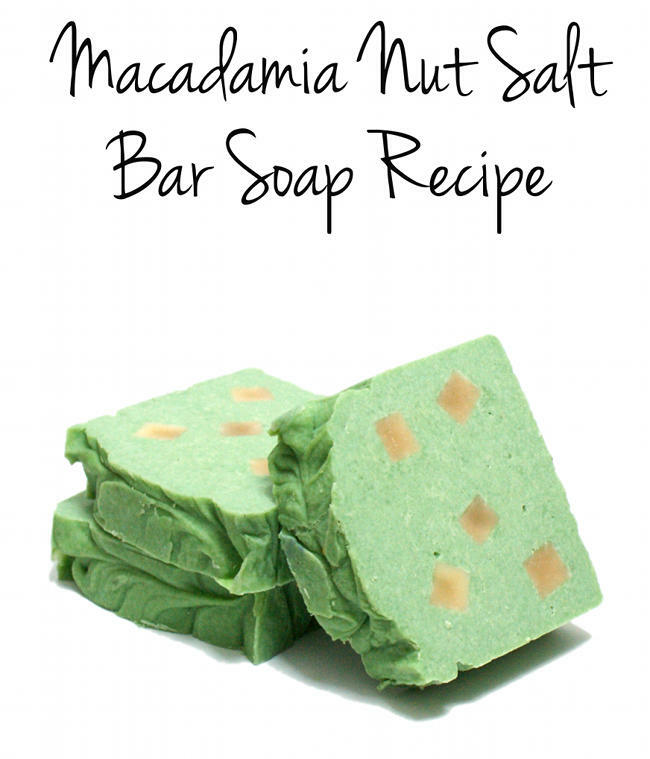 This fabulous homemade macadamia nut salt bar soap recipe is made with a generous percentage of moisturizing macadamia nut oil and natural sea salt that your skin will simply love. You can scent this one with your favorite fragrance oil – I used white tea – or omit the fragrance all together for the light natural scent of macadamia nut! To create this homemade cold process soap recipe you’ll need to follow my basic cold process soapmaking instructions. Begin by measuring out the water into a large Pyrex measuring cup or heat proof pitcher. Next, using a digital scale weigh out the lye then slowly pour the lye into the water. Mix until all the lye has dissolved then set the lye-water aside in a well ventilated area to cool. Now weigh out the soapmaking oils, cocoa butter, and stearic acid and combine in a large stainless steel pot. Heat over medium heat on the stove until all the ingredients have melted then set aside to cool. Once the soapmaking oils and lye-water have reached around 95°-100°F you’re ready to make soap! Slowly pour the lye-water into the soapmaking oils and mix with a stick blender adding the sea salt and fragrance at a light trace. Then combine thoroughly using your stick blender until soap has traced fully. Pour the soap into your prepared mold, cover and insulate. Twenty-four hours later you can unmold your soap loaf and cut it into bars. Allow the soap to cure 4-6 weeks before use for optimal results. This homemade cold process soap recipe will fit into one of my easy DIY Wooden Loaf Soap Molds. The final loaf will yield anywhere from 10-12 bars of handmade soap depending on how thick you cut them. 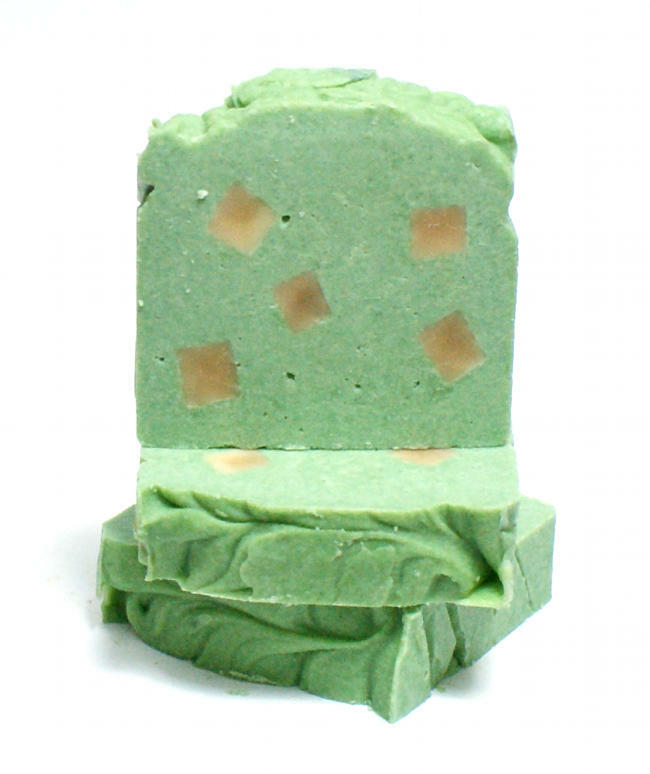 You can learn how to make a soap loaf cutter here for even bars. Want to make this homemade cold process soap recipe palm free? If you are unable to source palm free stearic acid simply substitute the stearic acid with slightly less beeswax! Or as the salt makes a naturally hard bar you can simply omit the stearic acid all together. For more homemade palm free cold process soap recipes go here. Or you can browse all of my homemade soap recipes by visiting Rebecca’s Soap Delicatessen. Also be sure to follow my DIY Bath and Body Pinterest Board for more great homemade soap recipes and beauty DIY’s from both Soap Deli News and around the web. Keep up with all of my new DIY bath and beauty posts by following Soap Deli News Blog on Blog Lovin’, Tumblr, Facebook, Twitter and Instagram. I have a quick question for you about the Dead Sea Salt. I keep reading everywhere NOT to use DSS in CP soap because it causes weeping and a very soft bar. Have you had any issues with this? Thanks! I don’t do what some consider a “true” salt bar with 50% salt. I’ve never experienced weeping but it could be because I use less salt. Did you obtain the green color from the salt? No, the green is a pigment. I used chromium green oxide pigment powder for the color.